1. Ideal for kids of ALL AGES. 2. Encourages children to be INDEPENDENT. 3. Easy to use - ILLUSTRATED RECIPES. 4. Recipes GRADED by LEVEL OF DIFFICULTY so that kids can start with the basic recipes and proceed to do the more complex ones. No more BORING BREAKFASTS,SOGGY TIFFIN BOXES and UNHEALTHY SNACKS for your children. Here is a recipe book designed and developed to help busy mothers' cater to their childrens' fussy food habits. EASY TO COOK, YUMMY TO EAT, and NUTRITIOUS too!! 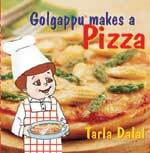 In this book, Golgappu learns an array of things, right from how to make and bake a pizza, to cutting and counting the slices, and making his own funny face pizza. An all new concept launched by Tarla Dalal – the Golgappu “Farm to Table” and “How to make series”. 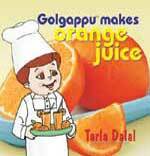 Golgappu loves to discover how some of his favourite foods are made and from what they are made. Come and discover with Golgappu the journey of wheat from the farm to the tava, in this story, ‘Golgappu Makes A Roti'.